New research from Roswell Park Comprehensive Cancer Center and MimiVax LLC shows that the protein survivin — one of the most commonly occurring molecules in cancer cells – may be an attractive target for a broad range of immunotherapy approaches, including CAR T. The findings have been published online ahead of print in Clinical Cancer Research. 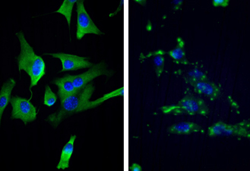 Fluorescent microscopy shows intra- and extracellular forms of the protein survivin. This work has opened up a variety of new options for using different forms of immunotherapy for hard-to-treat cancers. New research from Roswell Park Comprehensive Cancer Center and MimiVax LLC shows that one of the most commonly occurring molecules in cancer cells may be an attractive target for a broad range of immunotherapy approaches, including CAR T, or chimeric antigen receptor T-cell therapy. The findings have been published online ahead of print in Clinical Cancer Research, a journal of the American Association for Cancer Research (AACR). Survivin is a cell-survival protein highly expressed by many types of cancer, including many glioma, lung, pancreatic, breast and neuroendocrine tumors and some forms of multiple myeloma, lymphoma and leukemia. Emerging vaccine approaches developed at Roswell Park and targeting the survivin protein may be more effective than standard therapy alone for some patients with glioblastoma. Previously, survivin was thought to be present only inside the cancer cell, where some types of immunotherapy could not reach it. The new preclinical study is the first to report that this protein can be found on the surface of cancer cells, which means that certain forms of immunotherapy targeting the protein could be effective against cancer cells. This observation suggests that antibody-based treatment approaches, including survivin CAR T-cell therapy, could be used to target both solid and liquid tumors — a finding that could help broaden the applications for CAR T therapies generally. Current FDA-approved CAR-T therapies are limited to treatments for liquid/hematological cancers. The study, “Survivin Monoclonal Antibodies Detect Survivin Cell Surface Expression and Inhibit Tumor Growth in vivo,” is available at clincancerres.aacrjournals.org. The work was funded in part by support from the American Cancer Society, Philip H. Hubbell, the Linda Scime Endowment, the National Cancer Institute (project no. P30CA016056, the NCI’s core grant to Roswell Park), MimiVax LLC and by donations to Roswell Park. MimiVax LLC is a clinical-stage pharmaceutical company focused on the development and commercialization of immunotherapeutics and targeted therapies for cancer treatment. Its lead candidate, SurVaxM, an immunotherapy developed at Roswell Park Comprehensive Cancer Center, has undergone several clinical trials for glioma and is also being studied in patients with multiple myeloma. For more information, visit http://www.mimivax.com. Roswell Park Comprehensive Cancer Center is a community united by the drive to eliminate cancer’s grip on humanity by unlocking its secrets through personalized approaches and unleashing the healing power of hope. Founded by Dr. Roswell Park in 1898, it is the only National Cancer Institute-designated comprehensive cancer center in Upstate New York. Learn more at http://www.roswellpark.org, or contact us at 1-800-ROSWELL (1-800-767-9355) or ASKRoswell@roswellpark.org.